Here's a wrap-up for the past week. 2. I also had lengthy negotiations with an author and her publicists re a book giveaway of the cookbook, Simply Quince by Barbara Gazarian. The cookbook is the first of its kind to focus on the fruit, quince, and its many uses in jams, jellies, desserts, and meat recipes. Look for the giveaway which will be posted along with an interview with the author early this week. The author wanted to include a jar of her artisan quince jam along with the giveaway, but we decided on two books only. The interview will have details on where to buy her quince products. 3. Getting over a cold, but still had time for a quick visit to the library, where I borrowed Christopher G. Moore's Paying Back Jack, a thriller set in Bangkok. 4. Also speed read yesterday another library loan, The Cellist of Sarajevo by Stephen Galloway, a book I would recommend for its writing and its moving story of people under the strain of the war in Bosnia. 5. I was disappointed that my review post of Denise's Daily Dozen: Lose up to 12 Pounds in 2 Weeks didn't get viewers! It's an excellent and easy book to follow - exercises, eating tips, and recipes. Hope you check it out! 6. The Japanese Literature Challenge 3 ended yesterday. It has 241 book reviews posted by many, many different reviewers! I have 2 more books I started and will enter as a carry over to the next challenge, which will begin early summer. 7. Last day to enter a giveaway of a signed copy of The Last Surgeon, a medical thriller by Michael Palmer. Click on the book title to enter. Good luck! A news article printed yesterday by Reuters says what most of us readers, writers, and book bloggers can agree with. NEW YORK (Reuters Life!) – During tough economic times when U.S. consumers are trying to cut back, the indulgence they can't seem to live without is books. Three-quarters of adults questioned in an online poll said they would sacrifice holidays, dining out, going to the movies and even shopping sprees but they could not resist buying books. Dining out came in a far second with only 11 percent of Americans naming it their top indulgence, followed by shopping at 7 percent, vacations at four and movies, which was chosen by only 3 percent of Americans. "The recession highlighted the downside of greed, indulgence and giving in to temptation, but we noticed a shift back to life's simplest pleasures," said Michelle Renaud, a senior manager at Harlequin Enterprises Limited, which conducted the poll. Okay, so the poll was done by a book publisher, Harlequin Enterprises Limited, but it still has to be done scientifically and presumably accurately for it to make the news. Biochemists and epidemiologists, those who study diseases, and those concerned about climate change in the Arctic, would love this thriller. I liked it too though I have only a general knowledge of biology. It was a happy find during my stroll through a recent bookstore sale. Summary: There is something out in the Arctic that killed 3 scientists doing research in that hostile and freezing environment. There are scientists from several countries working on projects in the Trudeau Research Station, built on land that is part of Canada. Jessica has to deal with her complex investigations and more victims while making time for her personal life - keeping email contact with her young son back in the U.S. and being involved in a new and surprising love affair at Trudeau Station. Comments: Throw in post-Cold War politics, global warming effects on Arctic fauna and flora, Inuit and Aleut native cultures, submarine lore, and you have a mix that makes this thriller fascinating as well as informative. Definitely a 5 star novel. 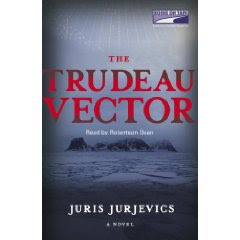 The Trudeau Vector: A Novel is published by Viking Books. The little Chihuahua, Humberto, walked past Dino. "Hey, Mr. Private Eye. How are you doing?" Publisher''s description: "an alternate-reality version of New York City, in which talking dogs interact regularly with humans. The hero, Dino Vicelli, is a private investigator who just happens to be a sharply dressed Italian greyhound with a great fondness for cigars. He takes on what initially appears to be a routine missing person case but soon finds himself in the midst of a sinister plot that involves kidnapping, murder, and bizarre scientific experiments aimed at controlling the world. As he investigates this strange case, Dino repeatedly encounters mortal danger, while also finding romance with a beautiful blonde Afghan dog." I've read mysteries featuring dogs and even talking cats, but this is my first mystery read with talking dogs! A little unusual yes, but the author Lori Weiner owns an Italian greyhound, Dino, who is the inspiration for the hero of her book. Dino may be a greyhound but he talks, walks, dresses, and acts human. He has no doggie traits, so this is definitely not a "pet mystery." I'm disappointed that Dino doesn't chase criminals on four feet as a greyhound might. He really is a human PI in disguise! The book was published by Dorrance Publishing Co., Inc., 2009. Paperback, 91 pages. Author Lori Weiner lives in Rancho Mirage, California, and is interested in show dogs. She owns an Italian greyhound named Dino. Thanks to Carol Fass Publicity for a review copy of the book. Things come in simple 12's in Denise's Daily Dozen: The Easy, Every Day Program to Lose Up to 12 Pounds in 2 Weeks. I liked the simplicity of this exercise and diet book by Denise Austin. I found it easy to follow and the exercises basic enough for me to remember and try! 2. A daily eating plan which I found useful and uncomplicated! And a checking list to keep you on track. 3. A daily exercise regimen, meal plan, recipes, and shopping list for each weekday, Monday through Sunday. I liked some of the food and fruit combinations: chopped oranges combined with blueberries; a wheat pita sandwich of turkey, sliced apples, baby spinach and a dollop of honey mustard! - 12 Healthy Rewards for Your Hard Work. If I can't follow the day to day regimen set out by the book, for whatever reason, I'd definitely still use this as a reference book for quick exercises and healthy recipes. Thanks to the Hachette Book Group for providing a review copy. Barbara Ghazarian has created a community of quince lovers, Team Quince, and directs us to her website, Queen of Quince, which offers quince food products. Ghazarian is also author of Simply Aremenian: Naturally Healthy Ethnic Cooking Made Easy. For a link to an interview with Barbara and a February GIVEAWAY of two copies of Simply Quince, click here. Disclosure: This book was provided free of any obligation by Publishing Works, Inc. No monetary or any other form of compensation was received. Publishing Works, Inc. is offering a 20 percent discount at the website, http://www.publishingworks.com/ At checkout, include the Coupon Code BLOG for a 20% DISCOUNT, courtesy of Publishing Works, Inc. and their continued support of book blogging! Happy reading! Who would think that a group of five knitters would have murder and mystery on their minds, not only once, but now for a second time? Knit, Purl, Die by Anne Canadeo is the second book in the Black Sheep Knitting Mystery series. Synopsis: Gloria Sterling had everything, as far as everyone could see. A very goodlooking woman, she had a young husband she playfully referred to as her "trophy" husband, money and property inherited from former husbands, a large and luxurious modern home, and social standing in the community. Gloria is even a good knitter. She befriends the five members of the Black Sheep Knitting Club - Maggie, Lucy, Dana, Suzanne, plus Phoebe, a college student working at Maggie's knitting shop - so that she might join the group. When Gloria is found floating facedown in her swimming pool, the five knitting club members become convinced her death is not suicide but foul play. They do some investigating on their own to find out the truth about their new friend, Gloria. Inbetween discussing, planning,and solving the crime, the group spend their time as regular knitting club members might, with their social chatter, plans to knit a blanket for charity, sharing knitting tips and cooking recipes, and discussing their personal lives. Comments: This mystery fits the bill of a cozy - there is no "blood and gore", the murder takes place "off scene," and the sleuths are amateurs, not professional investigators. Knit, Purl, Die is also an easy-to-read and entertaining whodunit. Never mind that you might guess the culprit before the very end of the book. The true motives behind the crime will remain a mystery till the end. Pocket Books Blog Tours: Thanks to Sarah Reid of Simon and Schuster for a copy of the book for review and for making this possible. GIVEAWAY for U.S. only : To enter to win one of two copies of this book, 1) leave a comment with your email address so I can notify winners, and 2) tell us the title of one of your favorite mystery novels. For an additional chance to win, become a follower. Pocket Books will mail directly to the winners. No P.O. boxes please. Contest ends Feb. 4; winners must respond by Feb. 6, after which new winners will be chosen. Teaser Tuesdays is a weekly bookish meme hosted by MizB at Should Be Reading. Choose two sentences from your current read, and add the author and title for readers. Anyone can join in. "The group will be returning to Calgary in November, and he wants to see me. I would like to see him but I don't know if it's a good idea to take on a third lover, especially one from Havana." (from the Oct. 23 journal entry, 2006). My comments: What I thought would be a light book on Cuba turned out to be an unusual travel memoir and more - add personal experiences behind the scenes, some away from the main tourist attractions. The author doesn't do only tourist jaunts. She has some good experiences but also some unpleasant ones, unhappy love affairs, and mixed encounters with tourists and expatriates from various countries. The author travels back and forth from her home in Calgary, Alberta, Canada to Cuba and writes this book as a journal that runs from September 2006 to January 2007. Canada has formal diplomatic relations with the Caribbean island, so Canadian citizens have no difficulty traveling there. Author Wanda St. Hilaire is a sales and marketing rep as well as a traveler and writer. She lives in Calgary, Alberta. This book was published by iUniverse in 2009. Thanks to Paula of AME for a review copy of this book. The Youngest Son: Memoirs from the Homeland is more than a diary of a professor in a foreign land. Written from the heart with a good dose of humor, this memoir recounts a very special and wonderful time in Oreste LeRoy Salerni's life – a pilgrimage to the motherland. The book is the product of a 6 ½ month sabbatical in Italy at the University of Pisa, which was a way for Salerni to pay tribute to his Italian immigrant parents. The completed sabbatical marked the fulfillment of a dream, full of joys, anxieties, travels, new friends, humor and the frustrations the Italian bureaucracy had with him. My comments: This is a delightful and informative account of Prof. Salerni's six months sabbatical at the University of Pisa in Tuscany, where he lectured, wrote research papers, and helped to edit scholarly publications in his field of pharmacy and medicinal chemistry. He and his wife Marti made numerous trips to other parts of Italy to visit relatives, sightsee, and to act as host to many visitors from the U.S. I learned a lot about the cities in Tuscany - the mountain top villages in Abruzzo where Oreste Salerni's parents were born, and the little town of Marlia near Pisa where the Salerni's lived during the sabattical. The travel memoir also took you to Florence, Siena, south to Naples and the Amalfi coast, and further south to Sicily. Half of the book is about his experiences as a visiting professor at the University of Pisa, where he made many friends among professors and students alike. Throughout the book are references to friendly people, the food of Italy, and the hospitality he enjoyed, even from strangers. I came away with a vision of a country with good food and a lot to see - historical buildings, countless churches and Roman ruins, breathtaking scenery. Oreste Salerni did a superb job of selling his parents' native country, giving wonderful descriptions and detailed information from his diary. He based his book on a journal he kept of his sabattical in Italy. I love traveling and this book satisfied my curiousity about parts of Italy I've never seen as well as my love of a good narrative. Thanks to Paula and Peppertree Press for the review copy of this book. I finished the Mystery Read-A-Thon this past weekend but have to confess I did not spend 12 hours reading mystery novels as planned! The Golden Globe Awards, chores, and other activities ate into my time! But I did finish Knit, Purl, Die by Anne Canadeo and started Pilikia Is My Business by Mark Troy. I'd love to do this read-a-thon again, on a longer 3-day weekend! I'm working on the Mystery Read-A-Thon which ends today, and tackling a book I've been meaning to read, Pilikia is My Business by Mark Troy, a mystery set in Hawaii. I've finished reading another mystery, Knit, Purl, Die by Anne Canadeo. I'm also working on finishing a travel memoir by Oreste leRoy Salerni, The Youngest Son: Memoirs from the Motherland, a personal account of a professor on sabbatical in Tuscany for six months in 2003-2004. I'm thoroughly enjoying it. Makes me want to see the parts of Italy I missed on a trip I took years ago after college! I visited Florence and Pisa in Tuscany, but haven't seen Naples, Mount Vesuvius, the picturesque Amalfi Coast, or Venice - places visited in this book. This past week, I reviewed and posted a giveaway of The Last Surgeon and an interview with author Christina Sunley, reviewed the cozy mystery, Truly, Madly, and shared a Japanese woodblock print and Chinese classical music on the blog. What have you posted on your blog this past week? 1. I wake up at 5 a.m. in the mornings unless I have a hangover. 2. I love sweets 3. I remember my bichon frise dog with great fondness. 4. I'm a secret gardener with a garden blog. 5. I'm a pack rat when it comes to books, especially mysteries! Knit, Purl, Die by Anne Canadeo. Pilikia Is My Business by Mark Troy, a book I've had for about a year now, but couldn't get past the tiny print. I understand it first came out in electronic format. Finish two books within 12 hours, then do a review of book one for Wednesday. No, only because I just found out about it. 5) If this is your first Mystery Read-A-Thon, how do you plan to go ahead? I'm finishing up the first book and hope to finish the second, which is 213 pages of very fine print! A good plot, fast paced action through quick dialogue, and an entertaining and suspenseful read throughout. A doctor with a heart of gold is pitted against a ruthless psychopath who has been hired as a contract killer by an unknown group. The killer thinks he is being humane by using bloodless and painless methods of dispatching his victims, but uses psychological terror nonetheless. Dr. Nick Garrity, in contrast, uses his talents to give medical care to the homeless and to war veterans. How their paths will cross, what far-reaching plot is behind the contract killings, and who will come out the winner are questions that kept me reading. Definitely an adults-only thriller, which builds suspense through psychological threats. Certainly not for the squeamish. Publisher's description: "Everyone told Gillian Coates that her sister's suicide was just that: a suicide. Everyone told Dr. Nick Garrity that his best friend, Lt. Umberto Vasquez, had simply disappeared, battling the demons of post-traumatic stress disorder. Gillian doesn't believe it. Nick doesn't believe it. And soon, they discover a chilling connection between these two seemingly random events...a common denominator that will lead a killer to the next victim...and the last surgeon. GIVEAWAY: Author Michael Palmer has offered a signed copy of his book to a U.S. reader. To sign up for a chance to win, enter a comment on this post by Jan. 31 and leave your email address; no P.O. boxes please. For an extra chance to win, follow me on Google Reader. GIVEAWAY UPDATE: On Feb. 1, Randomizer chose entry #1 - stacibuckeye as the winner of the giveaway. She will be notified by email and has two days to respond before another winner is chosen. Congrats Stacy! Published by St. Martin's Press; release date, Feb. 16, 2010. Thanks to author Michael Palmer for providing an ARC for an objective review. Challenges: 100+, Thriller and Suspense, Chill Baby, Chill! Q: Welcome to Book Dilettante, Christina! We'd love to hear how you came to write your first novel. 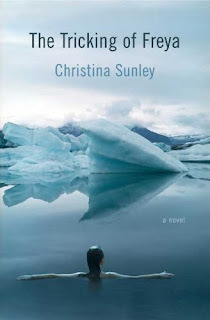 Christina Sunley, author of The Tricking of Freya: A Novel will discuss her book on Iceland and its history and culture. The daughter of Icelandic immigrants, her interest in history started with stories she heard from her mother. Can you tell us the most interesting stories that prompted you to write the book? Christina: There were two stories that my mother would tell me that especially struck me as a child. The first was of my grandfather as a young child in Iceland waking up to a morning sky black as night -- a volcano had erupted and caused widespread devastation in the area where he lived. The next story came from the following year in my grandfather's life, in 1876: impoverished by the volcanic disaster, his family set off on their shaggy horses under the midnight sun, crossed a river, and rode to the nearest seaport, where they took a ship to Scotland and then to Canada to join the "New Iceland" settlement. My mother also told me many stories about my grandfather's early experiences in the settlement, where they lived under harsh conditions as pioneers. I found those stories especially fascinating, and somehow haunting. Q: What about the research you did to write the book - the time spent, the places you visited, etc? • Floating in a boat on a glacial lagoon – the same lagoon with its dramatic icebergs that years later is now featured on the cover of my book. • Watching a sheep with spiraling horns climb on the ruins of the turf-roofed farmhouse where my grandfather had been born in another century. • Sampling hákarl, an Icelandic delicacy consisting of fermented shark meat. Enough said. • Riding a snowmobile over Vatnajökull, Europe’s largest glacier, and trying not to panic when it broke down in the midst of the vast icy wilderness. • Trekking a still-steaming lava field in the north, where astonishing ribbons of lava seemed frozen in midstream, gleaming with the colors of undiscovered planets. • Driving for hours by myself in a rented jeep and never seeing a single car or house or road sign along the way. • And, of course, writing down absolutely everything I saw, smelled, heard or imagined in my notebook. On my second trip to Iceland, I spent a month in Reykjavik taking an intensive language course in Icelandic. The next year, I spent a month as a writer-in-residence at Klaustrið (The Monastery), living alone in a stone farmhouse bequeathed by one of Iceland's most famous writers. It was just downstream from where my grandfather had been raised. I arrived at the beginning of May in the middle of a tremendous blizzard. It was so stormy most of the time I could hardly venture outside without getting blown over. There was nothing to do but write. I got more writing done in that one month than I had in the whole previous year. Q: Is the town of Gimli in Manitoba, Canada a real place? Are any of the characters in the novel based on real people?Christina: Gimli is a very really place – in fact, it was one of the first places the Icelanders named when they arrived at Lake Winnipeg. Gimli refers to a kingdom in heaven in Norse mythology. Today Gimli is a tiny Canadian fishing village with strong Icelandic roots. They still hold a large Icelandic Festival there each summer, which I write about in my book. Only one of the characters in my book is loosely based on someone real. Freya’s family friend, Stefan, was inspired by an Icelandic-Canadian historian and genealogist named Nelson Gerrard, whose research and publications are a great inspiration for me. You can learn more about his work at Nelson Gerrard. Q: You mentioned that only about 5 percent of your historical research findings went into The Tricking of Freya. How do you plan to use the other 95 percent? Christina: Probably what I meant to say is that only about 5% of the historical material that I wrote ended up in the book. There were several chapters of historical fiction taking place at different points in Icelandic history that I ended up cutting out of the book. Although I’m not sure I’ll ever be able to recycle those chapters anywhere, it did leave me with a longing to write a historical novel about the Icelandic immigration. Q: Have you always wanted to be a writer? At what point did you make this decision?Christina: My mother wrote my poems down for me before I knew how to write! I’ve always loved writing and started making “books” of stories and poems when I was about nine years old, but it’s something else entirely to declare oneself a writer and then manage to get writing done while living life and making a living…. Q: What are some of the books and authors that have influenced you over the years?Christina: I love Michael Cunningham, Michael Ondaatje, Virginia Woolf, Annie Proulx, Paul Auster, Halldor Laxness, to name a few. To the Lighthouse is probably my favorite novel of all time. Q: Is there anything else you would like to add for readers? Christina: I’m heading to Iceland for a book tour in June, where the book has been released in an Icelandic translation called Freyjuginning. Very exciting! At the end of March the paperback will be coming out in the US and Canada, from Picador, with a new cover and a readers guide for book groups in the back. I love talking with book groups, so if you have a group and are interested, please contact me through my website at Christina Sunley. Thanks for the interview, Christina, and have fun in Iceland on your book tour in June! It should be beautiful during summer there. Synopsis: Young Freya has been tricked more times than she likes, both in big and small ways. The biggest trick begins with an unexpected trip, when she is enticed by her aunt Birdie to travel with her for three weeks to the land of their ancestors, Iceland, supposedly to find the lost letters of their grandfather, the famous poet Olafur, Skald Nyja Islands. Freya normally lives in Connecticut with her mother Anna and only travels every summer to the small New Iceland community in Manitoba, Canada where her aunt and grandmother live. Freya is intrigued by her temperamental aunt Birdie, an aspiring poet who has manic highs and lows. In her good moods, Birdie teaches Freya the complex grammar of the Icelandic language and its folklore. Following that first trip to Iceland with Birdie, a disastrous summer trip that seemed like a wild goose chase, Freya visits Iceland again many years later after Birdie's death, this time alone and to find answers about the past, the identity of a mysterious relative, and about the biggest trick of all that had been ongoing over the years. Comments: I found this wonderful book at the library and borrowed it twice. The rich array of fictional characters created in the Icelandic community in Canada and in the homeland - from traditional to progressive to manic personalities - makes this an engrossing story, expertly told. I came away with a better understanding of Icelandic culture, the land and language, its folklore, and the history of Icelandic immigration to Canada beginning in the 1870s. The Tricking of Freya was published 2009 by St. Martin's Press. Other reviews of the book: Rose City Reader and The Boston Bibliophile. (To have your review listed here, leave a comment with your link). Lucy Valentine is psychic - she can't see people's auras as her father can, but she can find lost objects and see into the future, just by shaking someone's hand. The plot for this cozy mystery is unique - Lucy takes over her father's successful and well known match-making business while her dad recuperates after heart surgery. She matches couples by the color of their auras noted by her aura-seeing father in each client's personal file. Synopsis: When Lucy gets a new client, shakes his hand, and sees a vision of the ring he has lost, she literally freaks out. The ring just happens to be on the finger of a skeleton buried in a grave in a forest preserve. How Lucy solves this mystery and determines who-dunit is the basic plot of the book. Along the way, she plays Cupid to several other couples, both clients and friends, and does her father proud as an asset to his matchmaking business. She also finds the love of her life. Comments: The book has all the elements of a nice cozy - the murder takes place off scene, the mystery is light and easy to read, only the bad guys get hurt, and everything is hunky dory at the end. Love blooms throughout, so make this book a cute romance as well. I'm looking forward to more Lucy Valentine books - she is a very likeable and lively character with psychic as well as sleuthing abilities and a personality you'll just love. (ARC made available through LibraryThing Early Reviewers). Submitted to the Thriller and Suspense Reading Challenge 2010 and to the 100+ Reading Challenge. Other reviews of Truly, Madly: Just One More page...Or Two, Crazy for Books, and Alexia's Books and Such. 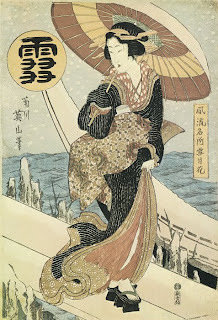 To celebrate reaching the 100 mark for followers of my blog, I've created an Asian theme with a Japanese woodblock print of a woman in a kimono and with links to a traditional Japanese celebration and to classical Chinese music. Hope you will enjoy them. The print above is courtesy of Dover Publications. Today, the second Monday in January, is Coming of Age Day in Japan, a holiday when 20 year olds officially reach the status of adult and are able to vote, among other pprivileges. In Japanese Customs and Traditions, Muza-chan has posted pictures of 20-year-olds dressed in colorful costumes to celebrate their coming of age. Though in formal kimonos, the young women chose bright, flowery patterns and have pinned flowers in their hair! There is also a video of a Coming of Age ceremony held in a Shinto shrine. For Asian music, there are two videos of Classical Chinese Music performed in the Golden Hall in Vienna with traditional instruments such as the two-stringed erhu. Hope you enjoy them. I did only one book review last week: Map of Paradise, but it satisfied three different reading challenges I'm doing this year: The China Challenge, the Chill Baby, Chill! review challenge, and the 100+ Reading Challenge. I love when one book counts for more than one! I started a cozy I got from LibraryThing, Truly, Madly by Heather Webber - a mystery/romance novel, which I am liking very much - humor, good plot, clever writing. Haven't gotten an answer back from author Christina Sunley re the Q & A interview I planned, so that may not happen, though I hope she's not too busy and may yet come through! 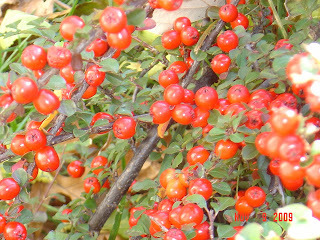 Posted a Wordless Wednesday photo of red berries, which many people liked - a spot of color in the winter white. I finally bought The Wind-up Bird Chronicle by Haruki Murakami, a novel which has to be savored and cannot be read in a hurry. I'm savoring it at leisure. New book to be reviewed: Dino Vicelli, Private Eye in a World of Evils by Lori Weiner. The hero is a private detective who just happens to be a nattily dressed Italian greyhound. Beats the talking cats in that other mystery series. For next week, I hope to do two book reviews and start reading a new memoir, The Youngest Son: Memoirs from the Motherland by Oreste LeRoy Salerni, about a teacher's sabbatical year in Italy. What have you done this past week? though the leaves have now gone. They stand out in the snow. The bush is a rockspray cotoneaster, identified for me by Jodi of Blooming Writer: Gardening in Nova Scotia. Click on the picture to enlarge it, and click on the link to visit Jodi's wonderful garden blog. 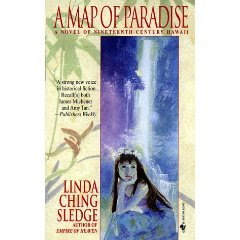 A Map of Paradise: A Novel of Nineteenth Century Hawaii by Linda Ching Sledge, author of Empire of Heaven. Publisher's description: With its green cliffs and silvery waterfalls, Hawaii offers radiant hope to Rulan and Pao An - exiles from China, immigrants with the will to succeed despite hardship and prejudice and enemies from their homeland. But his proud couple's hardest struggle will be with their own child - Mulan, called Molly. Born in Hawaii's sacred hills, Molly grows to despise the old Chinese ways. Locked in perpetual combat with her parents,she is drawn into a dangerous love affair with a glamorous but decadent poet, a protege of the (Hawaiian) king. And even as he family's fortunes rise, Molly's mother watches in sorrow, fearing that her child will realize too late that happiness lies far closer to home. Beautifully told, A Map of Paradise offers the colorful sweep of history with the satisfaction of characters intimately revealed. My comments: The Chinese immigrant Pao An worked in California before joining his wife Rulan and their daughter in Hawaii, called the Blessed Isles. There they built a life for themselves and formed a community with other immigrants. The core of the novel are the love stories of young Pao An and his wife Rulan, of their daughter Molly and the half-Hawaiian poet she lived with and loved, and of the quiet boy Lin Kong, whom Molly had grown up with and many times spurned as an adult. This historical novel describes the arrival of the Chinese as laborers for the sugar plantations in Hawaii in the mid 1800s, and of their gradual integration into the island economy as farmers, traders, and businessmen. The novel tells of the exhaustive work in forming a Chinatown community out of the two warring groups of Chinese - the Punti and Hakka clans. The book also details the history of the Hawaiian kingdom and the dying off of important members of its royal family in the latter part of the 19th century, giving way to increasing American and British influence and control of the islands. Rating: I gave this novel five stars for its descriptive storytelling and its detailed historical content on the Hawaiian kingdom and the settling of immigrants there in the late 1800s. A Map of Paradise was printed in 1997 by Bantam Books. I read this book as part of a reading challenge, which requires 10 books on China or by Chinese authors, now through Sept. 1, 2010: The China Challenge. I also submitted it for the Chill Baby, Chill! review challenge and the 100 + Reading Challenge. Happy New Year everyone! A new blog name for the new year - from Book Bird Dog to Book Dilettante. Hope you'll stay with me! What is The Sunday Salon? Every Sunday the bloggers participating in that week's Salon get together--at their separate desks, in their own particular time zones--and read. And blog about their reading. And comment on one another's blogs. You can join in, too! 1. This past week I got very little reading done over the New Year holidays! I posted a review of The Tricking of Freya, a novel of Iceland by Christina Sunley, on Dec. 27 and then a Teaser Tuesday on Dec. 28 with my New Year's resolution to follow the healthy eating advice in the book, Japanese Women Don't Get Old or Fat. 2. Am almost through reading A Map of Paradise, a book of Hawaii in the late 19th century. It was the only book I managed to sneak in during the week. 3. I sent a list of questions for an interview with author Christina Sunley re her book, The Tricking of Freya, and I hope to post her answers this week. I also finished reading The Last Surgeon, a thriller by Michael Palmer, and still have to write a review. 4. Returned from Canada yesterday after five days of visiting and eating and found in my mailbox, appropriately enough, Denise's Daily Dozen: The Easy, Every Day Program to Lose Up to 12 Pounds in 2 weeks, a book from the Hachette group. This should go a long way to help with my new resolution for 2010 - losing all the pounds I gained the last three months in 2009! and Chill Baby Chill! Reviews (this one runs to March 19, 2010)! Good luck with your reading in 2010!